The euro’s resilience in the face of the eurozone’s sovereign debt crisis has finally evaporated; the single currency has slid to a 16-month low against the U.S. dollar and an 11-year low against the Japanese yen. FT Lex’s Vincent Boland and Jennifer Hughes discuss the move’s significance and its implications. Source: Financial Times, January 7, 2012. This really illustrated the difference between ECB and the U.S. Fed–ECB`s sole mandate being to ward off inflationary pressures, versus the FED`s dual mandates of monetary policy being governed by unemployment levels and inflation concerns. As such, the Fed will be able to begin raising the Fed Funds Rate in 2011 as the unemployment rate most likely will not be under 8%, which is the starting point for even considering rate hike according to Bernanke`s remarks on the subject. For the most part of 2010, the typical image of Europe—one of cultural sophistication—has been replaced by widespread riots, burning cars, large scale strikes over labor reform and unemployment resulting from austerity measures amid a sovereign debt crisis in the region. Fear about defaults and more bailouts throughout the European Union (UN) has formed a dark storm cloud hanging over the otherwise robust global rally, and pushed Gold to an all-time high of $1,432.50 an ounce on Dec. 7. The market’s emotion related to the European debt crisis is clearly reflected through the interaction between Dollar, Euro and Gold, where you can literally trace the timeline of significant macroeconomic events in Europe and the United States (See Chart). The general pattern is simple – Whenever there’s bad news out of Europe, investors first course of action is to dump Euro and go into gold and dollar as the two top safe haven choices…. and vice versa. Historically, gold is seen as the ultimate hedge against inflation and dollar weakness with a typical inverse relationship with the U.S. dollar. Meanwhile, Euro had been gaining on the dollar as the choice of global reserve currency over the past decade mostly on concerns over the mountainous debt of the U.S. government. However, the conventional wisdom has been totally rewritten by the global financial crisis, the European debt crisis, and the unprecedented and synchronized global quantitative easing. As horrendous as the U.S. budget deficit and debt situation is, compared with the depth and breadth of European debt woes, investors now see euro as the risky currency, while dollar has regained its safe haven status as Gold. 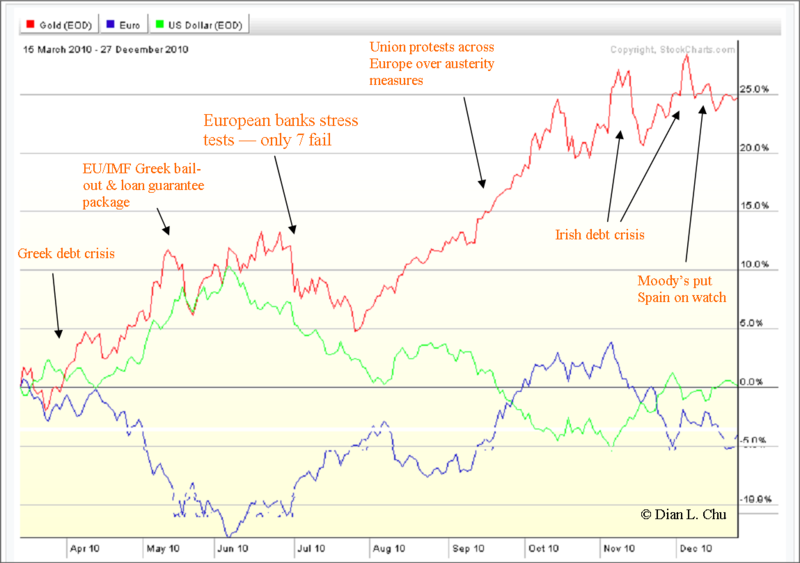 So, how will the dynamics between Dollar, Euro and Gold play out in 2011? At current price levels, the main gold buying action will come from investors and funds as inflation and currency hedge as well as price speculation, instead of from jewelry demand. From that perspective, there’s a fourth major player, in the name of China, emerging in the global gold market. Bullion Vault noted that with savings-deposit rates now more than 2% below the rate of consumer-price inflation, China has fast become the world’s No.2 source of physical gold demand. In fact, China recently revealed that its gold imports rose almost 500% year-over-year to 209 tons during the first ten months of this year. The 85 billion euros that were recently mobilised by the IMF, the European Union and various bilateral lenders to save Ireland – or, rather, to save banks and other private investors who have invested in Irish assets – confirms my view of the European Monetary Union (EMU) as a club with the wrong membership and a weak management. Early in 2010, Greece was the ideal scapegoat. A huge fiscal deficit which previous governments had tried to cover up with the help of creative bookkeeping and outright cheating provided a reason for the vilification of Greece. But it was membership in the currency union that had made it possible for Greece – and, indeed, for all members of the union – to benefit temporarily from a rising euro and easy access to cheap credit. Neither the financial markets, nor the European Central Bank (ECB) or other EU authorities, were vigilant enough to warn of the danger of the growing bubbles and deficits that came to characterise a large number of the euro zone countries. Yesterday Greece, today Ireland, tomorrow Portugal and Spain, the day after tomorrow perhaps Italy and France. A large part of the EU is in severe financial trouble and the recipient of punitive loans with adverse policy conditions attached. These are the prospects for an association that was formed with supposedly binding rules for responsible behaviour. The cornerstone of the EMU was the so-called Growth and Stability pact, which stated that no member of the club was allowed to run a fiscal deficit exceeding three per cent of GDP. When Germany and France soon after the formation of the EMU broke this golden rule the stability pact was de facto buried. At present, the average size of the euro zone’s fiscal deficit is 6,5 per cent of GDP. The next rule that was violated, and proved to be fiction last spring, was the “no bailout” clause in the Lisbon Treaty, which explicitly forbids the EU to rescue countries in crisis. Furthermore, the 110 billion package to Greece was, as was the case in the recent deal with Ireland, tied to the implementation of austerity policies that were so severe that even the IMF expressed its concern. The loan conditions to Greece and Ireland are very tough. But the EU and IMF message could also be interpreted in the following way by countries in crisis: if you promise to reduce your deficits you may borrow enough euros to be spared. For the time being. The third pillar of responsible behaviour was the European Central Bank, which was forbidden to bail out member countries in crisis by buying their government bonds. Today ECB is the largest – and soon, perhaps the only – together with China – single buyer of Greek and Irish bonds. The sellers are those private investors who with a sigh of relief are happy to find someone willing to buy their high-risk assets. These rescue operations suffer from one major weakness: they fail to solve the main problems of the euro zone, which are rather likely to be aggravated. If illiquidity, i.e. a temporary lack of liquid funds, is the problem, borrowing in order to bridge a brief financial gap is an excellent solution. But when a country – or an individual – is unlikely to be able to service its debt in a longer-term perspective, we are talking about insolvency. However, the crisis affecting a number of euro-zone countries is not a short-term liquidity crisis. If that had been the case, the rescue packages would have made sense. But we are dealing with a crisis of insolvency, not illiquidity. The EU leaders are amazingly silent on the grave predicament the EMU is now in. 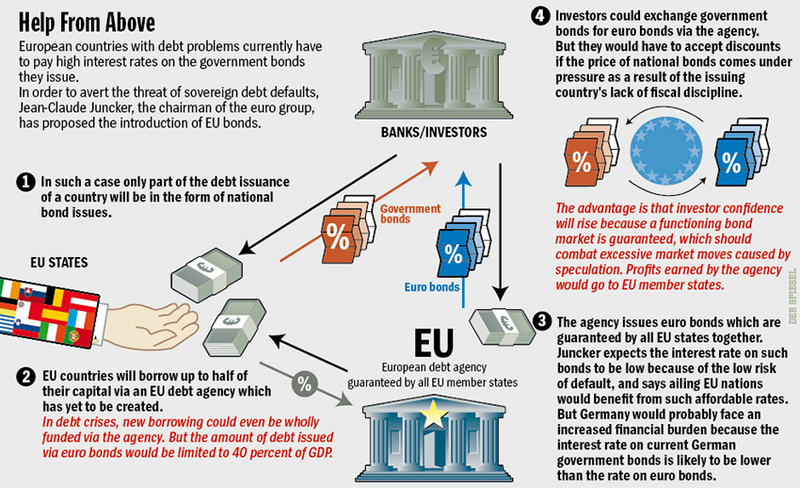 Simply put, those EU countries unable to service their debts will not be helped by taking up new loans, especially not if these loans are given at exorbitantly high interest rates. Source: Dr Stefan de Vylder, December 29, 2010. By Prieur du Plessis, on November 30th, 2010 posted in: Euro, Europe 2 people had their say - chime in! The Euro is coming down against the dollar “based on the fact that the economy in the U.S. is much stronger than in Europe,” Charles Nenner of Charles Nenner Research told CNBC.